"A highly amusing insight into the university sector as it has recently expanded relentlessly under government edict. It presents a devastating picture of the extent to which the notion of scholarship has been betrayed by a culture of managerialism, where the mediocre is airbrushed into ‘excellence', and achievement in research is subordinated to the spurious concept of‘ ‘academic leadership' to engineer bogus professorships for the unworthy. One's heart bleeds for the unfortunate hero lured by an unscrupulous vice-chancellor to throw in his lot with an institution where academic subjects are forced into an endless cycle of mergers with business-orientated units and his research belittled by envious superiors. One wishes only that we are given here a parody of life in some institutions – no such luck. A thoroughly good read, but best taken with a large scotch at hand to dull the pain as Charles' life unravels." Anonymous comments and feedback: "very funny and true to life" "deliciously vicious". 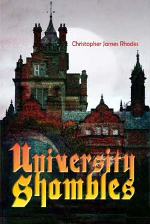 Kindle version of University Shambles available. A limited number of signed copies are also available direct from the author at £10/per copy plus £2.75 P&P. Buy using your credit/debit card via PayPal. Orders are handled by Publications at RBA Information Services.